Everyone seems to be getting a little uptight about news reports that Facebook is changing it’s algorithm to take non promoted posts out of the main newsfeed and onto a new feed, called the Explore Feed. A new system being trialled in six countries including Slovakia, Serbia and Sri Lanka sees almost all non-promoted posts shifted over to the new ‘Explore Feed’, leaving the main feed focused entirely on original content from friends, and adverts. So, where does all this talk and panic actually leave us; the business page owner? Big shout out to Mari Smith for her amazing article at MariSmith.com for helping me with the research on this article. What is Facebook’s new Explore Feed? Okay so what is it all about? Well, at the moment, the new Explore Feed is actually a way of discovering new content from pages you have not yet liked. So this should, in theory, provide a boost for some pages. The feed is based on the your use of social graph, pages and posts that your friends have liked, and pages similar to ones you already liked. Surely this is good news for page owners? Interactions on 60 biggest Slovak media Facebook pages. Facebook is testing Explore Feed since Thursday, October 19th 2017. Source: CrowdTangle. The test in these six countries apparently took out all of the main newsfeed posts and put them in the new Explore Feed, which is what caused the massive drop in reach. I think time will tell if the new feed will house all posts from the pages we like and follow with the main news feed being for posts from friends and for promoted posts. Why does Facebook need a new feed? Facebook’s main source of income now comes from advertising, with the main source being from mobile. They cannot insert more ads into the already clogged mobile feed, so they need a new way of getting more ads onto the platform without annoying it’s readers. Possibly groups – Facebook tested this last year but nothing came of it so far. As a business Facebook needs more ad space as more and more advertisers come on board, but it needs to fill those ad spaces without annoying their most important asset: Their readers. What Can Page Owners Do Just Now? My thinking on this might be a little contrarian as I see this as a good thing. If Facebook do eventually have a ‘Zero Reach‘ for page owners what is going to happen? more and more page owners are going to drop Facebook and move on. We have to remember that we do not own our Facebook page, Facebook owns it. We’ve had all this attention, if we’ve been doing it right, for the last few years and it’s all been free. My pages: Change Your Thoughts Today, now at 3.7 Million Followers, Your Digital Formula now at 185k Followers and Positive Life Affirmations at 417k Followers have all been grown organically and have made me a lot of money. What I teach in the Your Digital Formula program has also made the members a lot of money as well. So, I can’t really complain if Facebook were ever going to go the Zero Reach route. However, Zero reach has not happened yet, and may never happen, so the best thing we can do now is focus on growing our pages and monetising it as best we can before Z Day comes. Videos are THE main way to get more eyes on your page and to get people to follow you. If you can create engaging videos that people like, share and comment on then just keep creating more of the same. that 40 minutes spent on creation is well worth it. When you create video make sure you are catering to your core audience, which you will be able to find in the insights section of your page. No point in creating a funny video about how women are so bad at parking cars when your core audience is women aged between 24 – 54. Make sure you mix up the types of videos that you do to maximise engagement on your page. If readers see too many of the same types of videos it will put them off and they’ll eventually skip over your videos in their news feeds. “We’re focusing more on shorter form content to start. So the thesis that we have now is that there are different parts of short-term content. There is the type of content that people produce socially for friends,” he told investors. These types of videos will work well for advertising. So if you create ‘snackable’ videos you will get more reach and engagement if you were to advertise them in the Facebook network of advertisers. I know I just said create short videos, but it’s also important to mix things up as mentioned earlier. Creating longer videos, which is 90 seconds or longer is good digestible content in the readers news feeds. We know that Facebook wants to overtake Youtube to be the number 1 video platform so there has to be lots of different types and lengths of videos out there. Again advertising these types of videos is good for you and Facebook want mid roll ads in other longer videos so 90 seconds to 180 seconds is good. With 85% of videos being played on Facebook with the sound off (Hootsuite.com, 2017) it’s more important that you think about using captions. We have been square videos for over two years now on our pages and something I recommend everyone do to add to their repertoire of videos. Essentially with square videos you’re getting about 33% more newsfeed real estate than the landscape videos. The takeaway: Video format, regardless of the content, seems to play a huge roll in how many people watch your video, how long they watch it, and how willing they are to engage with it. We have been given a great opportunity to massively increase our KiLT factor (Know, Like, Trust) by doing live videos, where our knowledge is the main content and we are the main attraction. Facebook, in the beginning, rewarded people who were doing Facebook live shows. I remember the very first time I tried Facebook Mentions in San Diego, whilst at a ClickFunnels conference. I expected around 50 – 100 people to come on an watch me chat with them. It was around 7pm at night and I had just finished day 2 of the conference. I hadn’t a clue what I was going to be talking about and just wanted to jump on and test it. You see video is extremely important to Facebook and I cannot emphasise enough that you need to be creating more video content. Sometimes it saddens me to think that the written word is disappearing on social media and people want visual, quick, bytes of information, we have to go with the flow and give readers and Facebook what they want, and that is video. If you have a blog with more than 10 blog posts on it and the content is good, then make sure you are using Instant Articles. This is huge, but not only do you get a boost in reach on your blog posts you can get a huge boost in income using Facebook’s Audience Network ad platform, so why not utilise this to your advantage. The other great thing about Instant Articles is that not only do you get a boost in Facebook reach you get a boost in blog traffic as well, which is another boost in income if you have monetised your blog the right way. When I read a post about making money with Instant Articles I was blown away when I read an article from Stream-seo.com where the author advised he was making $22,000 per month from Instant Articles. I didn’t fully believe this at first. As I mentioned earlier the reach increase on the Instant Articles compared with normal blog post links is around 150% to 300% which helps you to grow your page and your audience. The money you can earn from Instant Articles can also help you to use part of that income for advertising. I would advertise videos to increase reach further and get more people to your page. Your email marketing and social media need to go hand in hand, though. Not everybody will open up your email (a good average open rate is 20%). However, the people who do open your emails are typically your best customers and repeat buyers. There are hundreds of articles online about how to grow your email list and there are a lot of great courses on it as well. If you’ve not already donw so, learn as much as you can about growing your list, AND also how to nurture your list. You email list can help you increase your followers on Facebook dramatically just by adding a link to your FB page in the bottom of every email you send. You can also have a dedicated email campaign to get readers to follow your page. We do not own our Facebook page, Facebook does and as such we should be building assets that we own, such as our email list. A lot of people are still not utilising the power of the messenger bot on their pages and it’s a shame as it is a really powerful tool. Over 900 million people actively using Facebook Messenger monthly worldwide. With the messenger bot you open rate, and clickthrough rate is generally much higher than that of emails. The image above shows 1 way you can use the bot, to create a sequence of automated messages going to your list. There is so much more you can do here. To conclude this article I would like to say that I cannot see Facebook ever going to Zero reach, however we have to prepare for that eventuality. 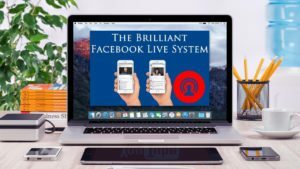 When we prepare for this happening we will not only focus much more on growing our audience on Facebook, but we will be ahead of the game if it ever does happen. Focus on the assets that you own like your blog, your email list and your contacts and nurture these like your business depended on it.